For so long, ever since this post about foods that commonly contain trans fats, I've meant to see for myself whether Cool Whip really did eliminate it from their product. People had commented on my post stating that the package says "0 trans fats". If this were true, then it would make for a better product. It still isn't good for you with all its fat and sugar, but at least it wouldn't be making things worse. Please pardon the blurriness, my cell phone wasn't designed for close-ups. 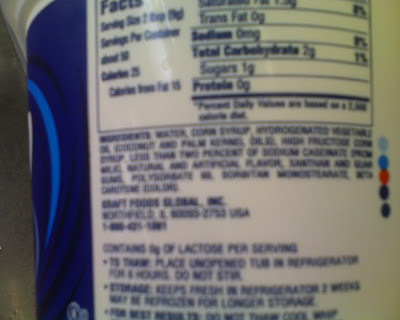 If you squint hard enough, you can make out the ingredients list: water, corn syrup, hydrogenated vegetable oil...! Ha! See? Never believe the large and colorful marketing statements on the front of the package. The FDA allows companies to make statements like "0 trans fats" if the amount is under a certain percentage. Their belief is a little bit won't hurt you. Well I disagree. Why not just cut it out altogether? Why do they have to deceive the general public who usually don't read ingredient lists? All gloating aside, my point is, always read the ingredient list, no matter what claims they make on the front. Even better, read the ingredients especially if they make claims on the front! Then you'll know what kind of company they are. If they like to make legal yet false claims, then they are not to be trusted. Better to just avoid that company's products altogether. Is it a bit drastic? Maybe, but with so many choices when you shop nowadays, why support the companies that don't have your health in mind? Great post! Unfortunatley this is typical of many big companies. They deliberatly decieve the consumer. Not showing exactly what they really have in thier products. The authorites really need to tighten up. We want to give you a chance to get free content for your website. We will write the articles for you, all you have to do is put them on your site, its completely free to you. If you ever run out of ideas on what to write about, just come to myfitnesscontent.com and grab an article. Each article is completely unique to your site and has never been used or published before. This is a great way to build your website with content, gain more visitors and hopefully in the end, earn some type of revenue off the site. With each article you post on your site, we will also build links to that article. This will allow your articles to rank well in google, bringing more traffic to your site. It sounds counterintuitive, but "fully" or "completely" hydrogenated oil doesn't contain trans fat. Unlike partially hydrogenated oil, the process used to make fully or completely hydrogenated oil doesn't result in trans-fatty acids. However, if the label says just "hydrogenated" vegetable oil, it could mean the oil contains some trans fat, but not necessarily.